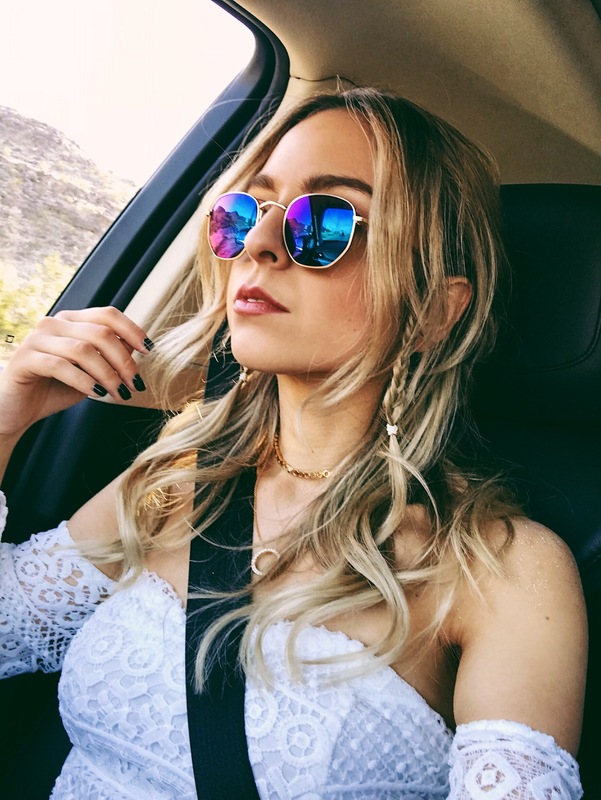 However, seeing Chiara’s posts I was directly hooked on the vibe of Coachella. Celebrating life in an oasis inbetween palm trees, dreamy sunsets, beautiful, young and cool dressed people… Suddenly attending Coachella got on my bucket list. It became a life dream of mine, however it seemed so far away and so unreachable. So, when I jumped on a plane to LA with my favorite people Nik and Elisa as well as my favorite Apollo sunnies last week everything seemed so unreal and my head was exploding due to all the ideas and expectations I had as well as all the organizational nightmare I was trying to handle. I am not going to make it a secret that I did not only go to Coachella ‘for the music’. Elisa and me also attended the festival to work there and produce as much content as possible – pressed into 3 intense days under the Californian sun. Honestly speaking, Coachella got me 1000% overwhelmed. During those three days of the festival we were living the extreme. We were working during daylight and trying to have as much of a good time as possible once the sun set. At the same time I was going through all kind of extreme emotions that sometimes changed by the minute. The one minute I felt so annoyed and just wanted to be home, the other minute I was uber euphoric and thought ‘wow, this life is too good to be true and can this festival please never end?’. I felt like this year the critical Coachella posts started rising already from Day 1 and I do want to give you my honest opinion about the festival. The most people complaning about Coachella focus on the point that people actually don’t come for the music but only for taking pictures and promoting brands. 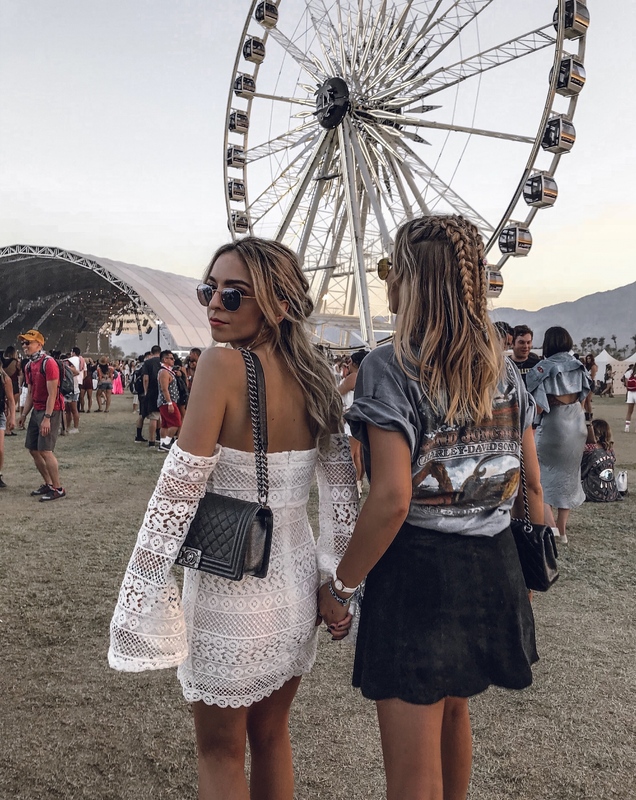 Yes, Coachella got super commercial – especially for bloggers – but honestly, I was never disturbed by people taking photos in front of the ferris wheel or bloggers promoting brands at Coachella. I mean, is there a better place to work than surrounded by palm trees, with perfect lighting in a crowd of laid back stylish people? If we’re being 100 % honest with ourselves: events are never solely about their ‘main purpose’ for the attendants. When people go to fashion weeks, it’s not only to see runway shows but also to network and ‘be seen’. And when we attend the birthday of a good friend of ours it might be mostly to mingle with other friends or enjoy the food – it’s never just about the birthday kid 😉 To me, this behavior is completely normal simply because humans are self-oriented and have their own hidden agenda. This is not reprehensible to me. I had my downs at Coachella for sure. The organization is a complete mess – I mean imagine hosting 100,000 festival attendants who want to park their cars in some small desert village with just one main road leading to the parking lots: F-U-N! It literally meant 2 hours of driving, finding a parking and walking to actually hit the festival ground from our Palm Springs house. And that messy organization also made me miss one of the acts I was looking forward most: Cardi B (yes, I didn’t know her yet back in Germany but gosh, this woman is a BOMB!). However, at the same time I had surreal moments of happiness, surrounded by my bestie Elisa and my fiance Nik and we have created memories I will draw on for a long time. We’ve danced to our favorite music acts – wearing our Apollo Optik sunnies – in a beyond beautiful area of lighting and art installations that felt like another world and those days were some of the best days of my life so far. Bottom line is: Coachella is 100 % what you make of it and what people you come with and I couldn’t have made a better choice. In addition, attending Coachella showed me that I actually CAN make my dreams become reality. Thinking back to that year 2012 Jecky – she never thought she would actually make it to that festival of all festivals but in 2018 she did! I know to some of you it might sound exaggerated but for me Coachella was a milestone and I can only urge you to give yourself the permission to believe in your dreams and work hard to make them happen. No matter how pointless or ridiculous they might appear to others! Yep, that one was a major bummer for me! You know this girl loves her DSLR photos but for Coachella I had to switch to my iPhone and a small digicam which we borrowed for our trip. I remember reading a blog post of Masha saying something like ‘If you like music but always thought festivals are too dirty for you, you will love Coachella’. After reading that I was sure I actually will love Coachella. However, I still wasn’t able to do without some of that ‘real’ festival experience: like having to mingle in the crowd with sweaty people, and having my first portapotty experience. There, I said it. Coachella is a mega event with about 100,000 attendants (50k too many if you ask me) which means you have to be prepared for spending a significant amount of your time in line. I wouldn’t have expected it to be really THAT bad. It started with endless car lines to get on the parking grounds, went on with security check lines (several ones while you walk those 2456 miles from parking to the festival), and went on for food, water and what so ever. Oh, and when leaving the festival in the night it literally took you 2 hours to get your car out of the parking and hit the street, no joke! It’s quite difficult to really describe the vibe of the Coachella attendants but if I had to I would call it a laid back, open-minded free spirit kind of vibe. It already starts on the plane to LA when you can sort of spot who of the passengers is going to the festival and just shyly smile at each other. 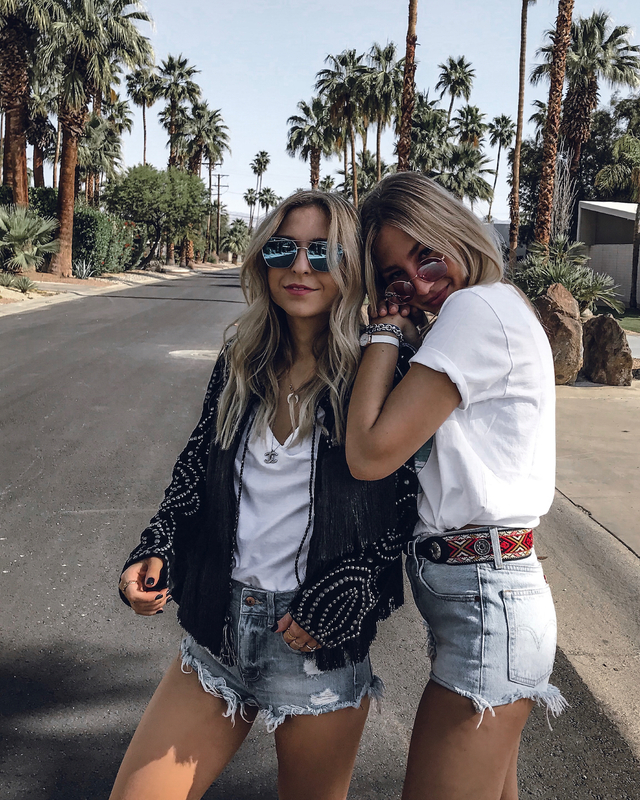 It continues in Palm Springs where it feels like the whole city is there for Coachella where you will basically tell your life story to strangers every day while waiting in line at Starbucks. At the festival itself, you feel like you can actually wear whatever you want and express your whole personality and literally noone will care or look at you because everyone just feels so free and is tolerant. Coachella – kaum ein anderes Festival wurde in der Presse und den sozialen Medien so extensiv fotografiert, gestreamt und vor allem DISKUTIERT. Dieses Jahr war ich zum ersten Mal bei diesem Event der Superlative und kann nun, nachdem ich mir eine gute Woche Zeit genommen habe, alle meine Erfahrungen zu verarbeiten, einen 100 % ehrlichen Blogpost zum Coachella mit euch teilen. Gemeinsam mit allen Looks, die ich zum Coachella getragen habe (Hallo, Sommer Boho Outfit Inspirationen!! 😉 ), sowie meinen liebsten Apollo Sonnenbrillen, die mich bei diesem Trip ununterbrochen begleitet haben und das perfekte Accessoire sind, um sommerliche Festival-Looks abzurunden. Dennoch war ich nach Chiaras Post sofort unglaublich angetan vom Vibe des Coachellas. Davon, das Leben unter Palmen zu zelebrieren, inmitten von schönen, jungen, stylischen Menschen und traumhaften Sonnenuntergängen. Das Coachella wanderte sofort auf meine Bucket List. Es wurde zu einem Traum der so weit weg und völlig unerreichbar erschien. Als ich letzte Woche also mit meinen liebsten Menschen Nik und Elisa, sowie meinen liebsten Apollo Brillen im Gepäck in den Flieger nach LA stieg fühlte sich alles absolut surreal an und mein Kopf explodierte fast vor Ideen, Erwartungen und dem Versuch, organisatorisch alles unter einen Hut zu bekommen. Ich möchte kein Geheimnis daraus machen, dass Elisa und ich nicht nur ‘für die Musik’ zum Coachella anreisten. Wir waren auch beruflich da mit der Aufgabe, so viel tollen Content wie nur möglich rauszuholen. Das Coachella hat mich zu 1000% umgehauen. Während dieser 3 Tage des Festivals war unser Leben im wahrsten Sinne extrem. Wir haben im Tageslicht gearbeitet und versucht, das Festival so gut es geht zu genießen und zu zelebrieren sobald die Sonne unterging. Zugleich wechselten auch meine Emotionen vom einen Extrem ins Nächste. Mal war ich genervt und wollte einfach nur nach Hause – eine Minute später ergriff mich die Euphorie und ich wollte, dass dieses Festival nie endet. Mir kam es so vor, als gingen die Coachella-kritischen Posts dieses Jahr besonders früh los und deshalb möchte ich euch auch diese Seite des Festivals ehrlich beleuchten. Wenn wir mal 100 % ehrlich zu uns selbst sind, werden wir uns eingestehen müssen, dass es bei den meisten Events für die Besucher nie nur um den Hauptgrund des Events geht. Bei Fashion Weeks kommen die Leute auch nicht nur für die Modenschauen, sondern um sich zu vernetzen und gesehen zu werden. Und wenn wir zur Geburtstagsparty eines Freundes gehen ist das oft auch nicht nur um das Geburtstagskind zu zelebrieren, sondern auch alte Freunde wiederzusehen oder sich den Bauch mit Kuchen vollzuschlagen 😉 Für mich ist dieses Verhalten absolut menschlich, denn wir Menschen sind nunmal ichbezogen und haben auch unsere eigene ‘geheime Agenda’. Eines ist sicher: beim Coachella hatte ich auch so meine Tiefs. Die ganze Organisation des Festivals ist an vielen Stellen chaotisch. Stellt euch einfach mal vor, dass 100.000 Menschen in eine kleine Einöde in der Wüste einreisen und alle ihr Auto parken wollen, wobei es nur eine Hauptstraße gibt, die zu den Parkplätzen führt. Hört sich nach Spaß an, oder? 😉 Wir brauchten locker 2 Stunden bis wir von unserem Haus in Palm Springs auf dem Festival Gelände ankamen: samt Fahren, im Wirrwarr an einen Parkplatz geführt werden und dann zum Festivalgelände laufen (ca. 40 Minuten samt etlichen Kontrollen). Dank diesem Chaos habe ich auch einen der Acts verpasst, auf den ich mich am meisten gefreut habe: Cardi B (in Deutschland kannte ich sie so gut wie gar nicht, aber diese Frau ist eine BOMBE!). Dennoch bescherte mir das Festival zugleich pure Momente des Glücks mit meinen Lieblingsmenschen. Wir haben Erinnerungen geschaffen, von den ich noch lange zehren werde. Wir haben in einer total surrealen Umgebung aus Wüste, Kunst- und Lichtinstallationen und Palmen zu unseren liebsten Musik-Acts in unseren Apollo Sunnies getanzt und ich wage zu behaupten, dass diese drei Tage zu den besten Tagen meines bisherigen Lebens gehören. Das Coachella ist in erster Linie und zu 100 % das, was man daraus macht und mit welchen Leuten man dort hingeht. Hier hätte ich keine bessere Entscheidung treffen können. Außerdem hat mir das Coachella gezeigt, dass ich es in der Hand habe, meine Träume Realität werden zu lassen. Wenn ich an Jecky im Jahr 2012 zurückdenke – sie hätte nie geglaubt, dass sie es wirklich mal zu diesem Festival aller Festivals schafft, doch in 2018 ist dieser Traum in Erfüllung gegangen. Vielleicht hört es sich für den ein oder anderen von euch übertrieben an, aber das Coachella war für mich eine Art Meilenstein und ich kann euch nur dazu drängen, es euch selbst zu erlauben, an eure Träume zu glauben und hart für sie zu arbeiten. Ganz egal, wie unwichtig oder lächerlich sie auf andere wirken mögen. Jap, dieses Verbot hat mich ganz schön aus den Socken gehauen! Ich liebe Bilder von unserer Spiegelreflex und musste mich fürs Coachella erstmal richtig umstellen: auf iPhone Bilder und eine kleine Digicam, die wir uns extra für den Trip geliehen haben. Coachella ist ein mega Event mit ca. 100.000 Besuchern (was 50.000 zu viele sind, wenn ihr mich fragt). Deshalb gehört Schlange-stehen ganz fest zum Coachella, damit hatte ich schon gerechnet. Wie schlimm es aber wirklich werden würde – davon hatte ich keine Vorstellung. Angefangen mit Schlangen beim Parken, Schlangen bei den Sicherheitskontrollen auf den 2375 km Weg zum Festivalgelände, Schlangen beim Essen, Wasser holen usw. Die schlimmste Schlange ergab sich jedoch Nachts wenn das Festival vorbei war. Hier hat man auch schon mal 2-3 Std gebraucht um sein Auto vom Parkplatz auf die Straße bewegen zu können. Es ist ziemlich schwer, die Stimmung zwischen den Coachella Besuchern zu beschreiben – es ist ein cooler Mix aus lockerer, offener Einstellung und einem free-spirit Vibe. Es beginnt schon beim Flug nach LA, wo man ziemlich genau erahnen kann, wer von den Passagieren zum Coachella anreist und sich schüchtern ein Lächeln zuwirft. Und es setzt sich fort in Palm Springs, wo ca. die halbe Stadt fürs Festival da ist und man täglich fremden Menschen in der Starbucks Schlange seine halbe Lebensgeschichte erzählt. Auf dem Festival selbst fühlt man sich so, als könnte man alles anziehen und seine Persönlichkeit zu 100 % ausleben, weil es einfach alle tun und alle super tolerant sind. Vielen lieben Dank für deinen Erfahrungsbericht. Immer wieder schön verschiedene Ansichten zu hören. Sehr interessanter und ehrlicher Beitrag liebe Jecky! Hat Spaß gemacht, ihn zu lesen! Aber nichtsdestotrotz freue ich mich zu hören, dass dir das Coachella gut gefallen hat und du eine gute Zeit hattest. Deine Brillen sind übrigens der absolute Knaller. Sounds like an amazing experience! And yes, I completely agree with you. 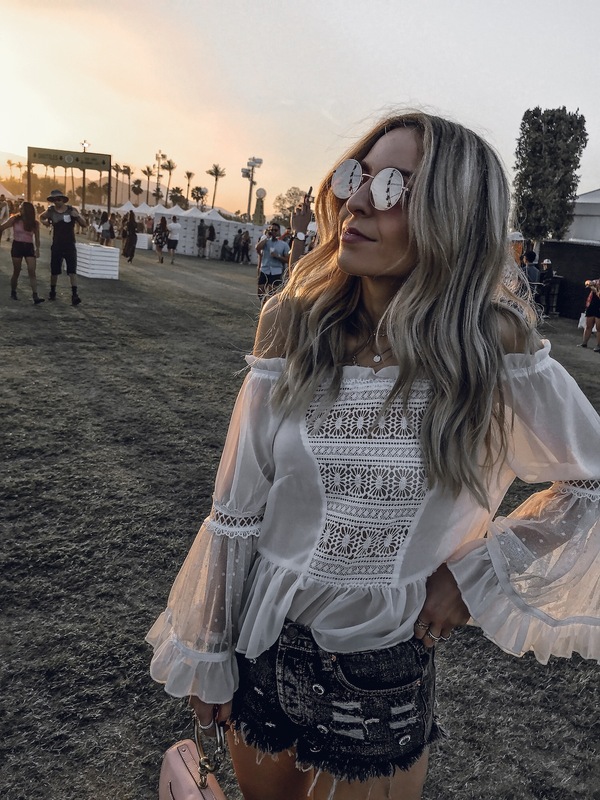 Coachella, as with other festivals, serves multiple purpose. And it definitely offers plenty of opportunities for people, brands, and businesses, and there’s nothing wrong with that. It’s part of the whole package of the event. So might as well enjoy it. Anyway, your photos are really lovely dear! Meine liebste Jecky, ein absolut toller Post…ich weiß gar nicht wo ich anfangen soll! Ich bin begeistert von den Bildern, sie bringen total die Vibes rüber, die ich auch so liebe und kann dir nur zu stimmen: unter Palmen arbeitet es sich doch nicht schlecht! Die Sonnenbrillen sind auch der perfekte Begleiter gewesen, ich finde sie alle toll! Und zu guter letzt: Coachella ist nach wie vor auch einer meiner unerfüllten Wünsche und ich trotz aller Diskussionen rund um das Festival kann ich es kaum abwarten, es selbst zu erleben. Ich finde es genau richtig, dass ihr eure Zeit dort genossen habt und euch nicht von den Gegnern habt beeinflussen lassen. Zudem finde ich es auch natürlich und normal, die Zeit dort auch zu nutzen um tollen Content zu erstellen und gleichzeitig zu den liebsten Künstlern zu tanzen. Warum das einige nicht kombinieren können, kann ich nicht wirklich nachempfinden, glaube mit guter Orga geht Alles ;). Man sieht, ihr hattet euren Spaß und habt das Beste rausgeholt!